The Hotel Santasport is a conveniently located Hotel in Rovaniemi. Food is accessible through the provision of an on-site restaurant. For business travellers, this accommodation features conference/meeting rooms and there is no cost Wireless Internet connectivity within the hotel in both public and in-room hotel areas. Parking amenities includes an on-site car park. Aqua related facilities include a whirlpool and an indoor and outdoor swimming pool. Fast check-in/check-out is also conveniently available for travellers. 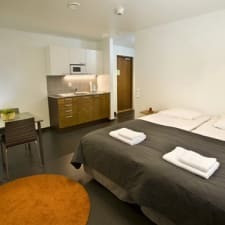 In this accommodation room amenities vary and contain an array of features including central heating, hairdryer, refrigerator and coffee/espresso machine. Cable TV is available for guests to enjoy for in-room media entertainment.